Note: While on vacation, visiting 3 children and my husband’s son in Calif. & Nevada, I am re-posting this spring article. Here are two using asparagus, which are readily available. I prefer organic when I can get it, since I cannot peel it. 1. Prepare rice first. If you precooked the rice earlier, then you can skip this step. 2. 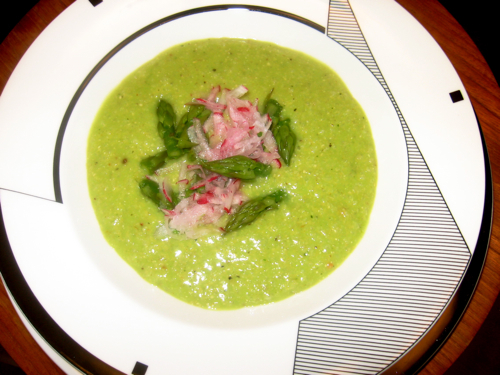 Using a large fry pan, place about 1/2″ of water or stock in the pan and simmer the trimmed asparagus until it is tender-crunchy and still bright green. Almost all the liquid should be gone. If not, you can add it to the soup so none of the nutrients are lost. 3. Place about one cup of water or stock in the food processor or blender. Add garlic, half the cooked asparagus and buzz. Then add about half the cooked rice and blend again, adding rest of liquid, as needed. (If your blender head is small, add the first half of pureed amount into a soup pot.) If not too small, add the rest of the asparagus and rice and any additional liquid to make a thick puree, adding any of the asparagus cooking water as well. 4. Add salt, pepper, and a dash of cayenne to taste. You may also use low sodium soy sauce instead of the salt. Place pureed soup in soup pot to reheat and allow flavors to blend. Note: Depending on the kind of rice rice and how many asparagus spears you used, you may have to add more liquid to make the dish “Soupy.”Also, if you have enough leftover to refrigerate, the next day you may have to add more liquid, as the soup tends to thicken when chilled. 5. Serve in bowls garnished with scallions and/or grated radish. Yields about 3 – 3/1/2 cups soup, or more if you like it thinner and add more liquid. Variation: Use curry powder to taste instead of salt, pepper, and cayenne. 1. Spray a large fry pan with olive oil. Add garlic, bell peppers, leek, and tempeh and stir fry about 5 minutes. Add some water if the veggies begin to stick. 2. When the veggies are still crunchy, but not raw, add bean sprouts and cook another 3-4 minutes, adding more water, if needed. While the veggies are cooking, stir together abou1 one tablespoon toasted sesame oil, 1/2 tablespoon rice vinegar, and a dash or two of ginger powder (or fresh ginger) and soy sauce to taste. 3. Shut off heat. 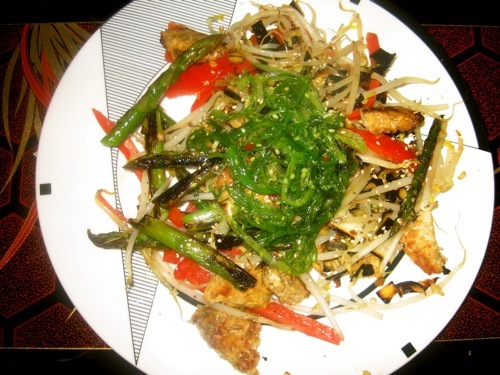 Toss dish with oil & vinegar mixture, sprinkle on sesame seeds, and serve hot. 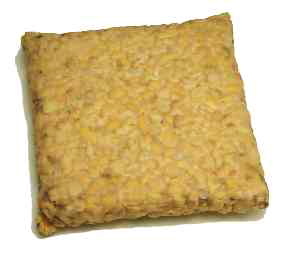 * Tempeh is a soy product made from whole soybeans into a square or rectangular shape that can be cut or chopped or grated when heated. It is not as popular as tofu, so you may only find it in a health food store or a very large supermarket such as Wegmans. It has a “meatier” texture. (Excuse the reference!) A definition is also in the Glossary. This entry was posted on Monday, May 4th, 2015 at 12:42 pm	and is filed under Kitchen Nutrition. You can follow any responses to this entry through the RSS 2.0 feed. You can skip to the end and leave a response. Pinging is currently not allowed. we can even think of serving some soup cold rather than hot.